Save cash by purchasing a Makarska Riviera holiday package. Just select your favourite options and let Expedia take care of the rest. As much as 15%* can be saved when you secure your package deal on Expedia. Our expansive database lists more than 400 partner airlines and 321,000 worldwide properties. With such a great range of options, you can't go wrong! Almost all accommodations can be cancelled without any additional charges from us. There are loads of awesome things you can do when you visit a new place. So why not get your trip to Makarska Riviera off to a sensational start by checking out some of our ideas? After all – out there starts here! The protection of valuable habitats and species is vitally important. Relax in the peacefulness of nature at Biokovo Nature Park and see what types of animals have made it their home. There's a wonderful range of things to keep you busy in this destination. Grab some cheese, crackers and a bottle of wine and make your way to Tucepi Beach. It's one of the most stunning destinations in the surrounding area for a leisurely picnic. Still got some time on your hands? In the mood for a picturesque afternoon on the shoreline? Pack a camping chair and find the best spot to take in a brilliant ocean sunset at Podgora Beach. Plan ahead and secure a cosy bed in Makarska Riviera today. With no less than 11 accommodations listed on Expedia, you're bound to find a place with everything you need for your cheap holiday or luxury getaway. Fluffy robes, deep bathtubs and high-quality furnishings are just some of the things you should find waiting for you at the Hotel Laurentum (Kraj 43) and the Bluesun Hotel Afrodita (Dracevice 33). Reserve a room now for a taste of the high life! If you don't really like shelling out such big bucks, why not spend your nights somewhere more economical? Try the Hotel Podgorka (Branimirova obala 87) or the Camp Dole Zivogosce (D8, 21329). There's nothing as satisfying as arriving at Brac Island Airport (BWK) after a long flight. Once you've secured your bags and stretched your limbs, you'll find yourself just 25 miles (40 km) from Makarska Riviera's main streets. 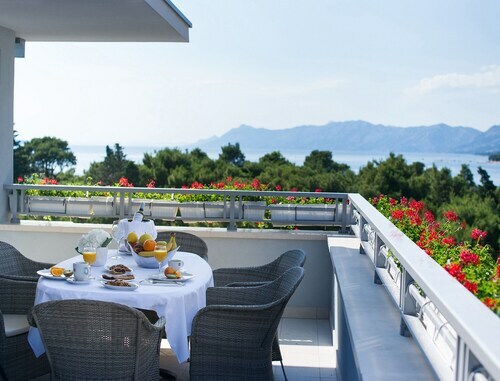 Situated on the Strip, this hotel is within 1 mi (2 km) of Makarska Promenade and Makarska Beach. Makarska Ferry Port and Church of St. Philip are also within 10 minutes. Located in Makarska Old Town, this spa aparthotel is within a 5-minute walk of Makarska Promenade and Makarska Beach. Makarska Ferry Port and Church of St. Philip are also within 5 minutes. Nestled on the beach, this Podgora hotel is within a 15-minute walk of Podgora Beach and Podgora Harbor. Tucepi Beach and Tucepi Harbor are also within 3 miles (5 km). Nestled on the beach, this Tucepi hotel is 0.2 mi (0.4 km) from Tucepi Beach and 3 mi (4.9 km) from Makarska Beach. Podgora Beach and Tucepi Harbor are also within 3 miles (5 km). 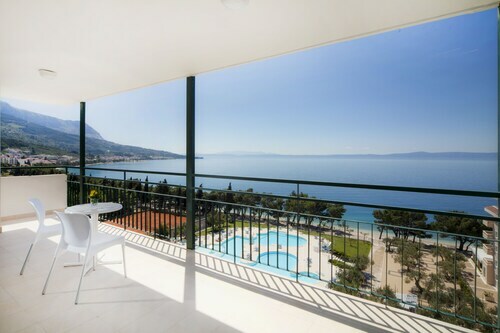 Located in the heart of Makarska, this spa hotel is within a 15-minute walk of Makarska Promenade and Makarska Beach. Franciscan Monastery and Sea Shell Museum are also within 10 minutes. 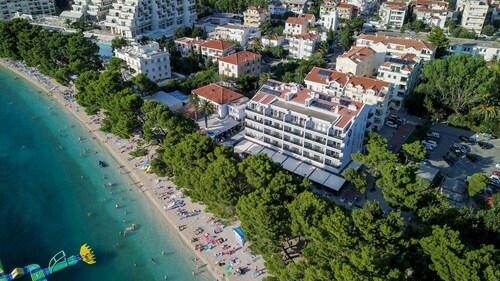 Located in Makarska, this beachfront hotel is on the boardwalk and within 1 mi (2 km) of Makarska Promenade and Makarska Beach. Makarska Ferry Port and Church of St. Philip are also within 15 minutes. 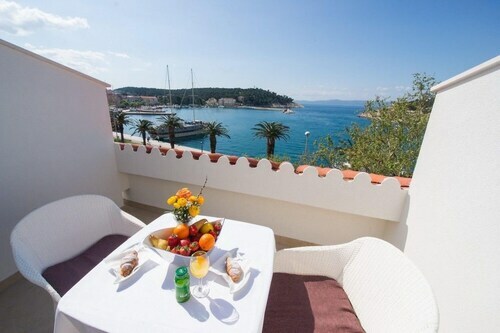 Located in Makarska Old Town, this hotel is within a 5-minute walk of Makarska Promenade and Makarska Beach. Makarska Ferry Port and Church of St. Philip are also within 5 minutes. Nestled on the beach, this Brela hotel is within a 15-minute walk of Baska Voda Promenade and Baska Voda Beach. Brela Beach and Punta Rata Beach are also within 1 mile (2 km).